Do Libations Like Wine and Beer Reduce Your Risk For Kidney Stones? Kidney stone pain is unlike anything else—many compare the pain of kidney stones to that of childbirth. As uncomfortable as kidney stones are, there is little to do about them when you have one. Most of the time you have to wait for the stone to pass before experiencing relief, or undergo a kidney stone procedure to break the stone up into passable amounts. Either way, it’s easy to see that kidney stones are no fun! And since 19 percent of men and 9 percent of women will experience at least one kidney stone in their lifetime, it becomes even more important to do whatever you can to prevent kidney stones in your own life. When it comes to preventing kidney stones though, there’s always quite a bit of debate—especially when it comes to which fluids work and which don’t. Obviously drinking lots of water is ideal for preventing kidney stones, but what about other fluids? Disclaimer: While there is no proven connection between libations such as beer and wine and the prevention of kidney stones, studies have been conducted that show libations can actually have a positive impact on your kidney health and lower your risk of kidney stones. We plan to discuss these findings below, and offer our advice for healthy fluid intake in regards to kidney stones. So, it’s time to settle the debate—does wine really prevent kidney stones? In this epidemiological study on beverages and their impact on kidney stones, researchers followed 194,095 people over the course of eight years. The study was conducted to see if there was any correlation between the type of fluid participants drank, how much of each beverage they drank, and its effect on kidney stones. At the completion of the study, 4,462 people had a kidney stone at one point or another. It’s important to note that none of these participants had a history of kidney stones beforehand. Researchers first established the kidney stone risk level for each participant based on health and dietary factors. The study was broken into three parts, to examine three different sample sizes. Researchers found that sugar-sweetened colas and non-colas, fruit punch and diet non-cola drinks increased the risk of kidney stones, in some cases up to 33 percent. On the other hand, beer, white and red wine, caffeinated and decaf coffee, orange juice and tea reduced the risk of kidney stones drastically. Beer proved to reduce the risk of kidney stones up to 41 percent, and wine (specifically white wine) reduced kidney stone risk by 33 percent. So, according to this study, libations like wine and beer may actually be useful in preventing kidney stones! But why? 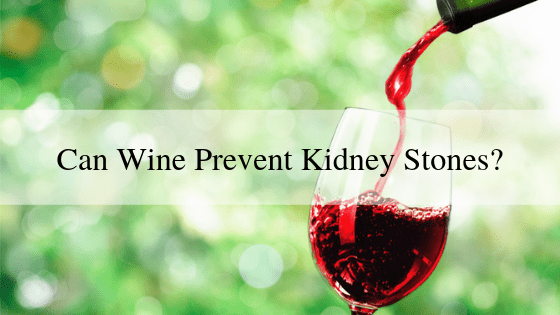 To understand why certain beverages such as wine have a positive influence on kidney health, you first must understand what causes kidney stones in the first place! Kidney stones are actually crystals that form from different materials in urine. When the concentration in urine is made up of more waste than fluid, it can sometimes cause the waste to build up and form kidney stones. Each type has its own causes, but the makeup of each is relatively the same. When broken down, kidney stones are usually made of calcium, urate, cystine, phosphate, oxalate, and xanthine. This explains why different beverages produce a higher risk of kidney stones than others. Soda is made up of processed bleached sugar, phosphoric acid, caffeine, and high fructose corn syrup, among other things. High fructose corn syrup can metabolize into oxalate and increase excretion of uric acid and calcium. These high levels of oxalate, uric acid and calcium can cause kidney stones to form. Therefore, it’s easy to see that soda may result in higher risks of kidney stones. Libations like beer and wine, on the other hand, do not break down into these harmful acids. Wine breaks down into helpful antioxidants, which are beneficial to your body. However, don’t read this as a reason to ingest copious amounts of wine. The key here is moderation, as with any beverage you drink. With that being said, let’s discuss how much of each beverage you should be drinking to help prevent kidney stones. As we mentioned before, moderation is key when it comes to libations like beer and wine, as well as beverages like soda, juice and coffee. When it comes to wine and beer, drink the recommended serving amount daily or weekly. For beer, this would be no more than 12 ounces every day. For wine, five ounces a day is the preferred amount. Since soda and sugar-filled drinks are known to increase the risk of kidney stones, we recommend drinking these as little as possible. However, if you do drink a soda, limit it to 12 ounces. Try to limit your coffee intake to eight ounces, and juices to six ounces. As always, your safest option is to choose water. However, when it comes to preventing kidney stones, the goal is to increase your fluid intake. This fluid doesn’t have to be just water! If you decide to mix your fluid intake between water, coffee, alcohol, etc., do your best to stick to recommended servings to decrease your risk of kidney stones. While you may do your absolute best to lower your risk of kidney stones, you might still end up with a stone after all. If this happens, continue to increase your fluid intake. As we said earlier, you’re probably going to have to flush the stone out on your own, and you can’t do that with a low amount of fluids. However, if you’ve never had a kidney stone before, or you aren’t sure if it’s passable, don’t wait to call your urologist. Some stones are too large to pass, and will need surgery to break them apart. We know just how painful kidney stones can be—and we don’t want you to deal with kidney stones alone! If you’re struggling with kidney stones, schedule an appointment with one of our board certified urologists sooner rather than later. We can assess the state of your kidney stone, and give you helpful steps for moving forward. Our urologists can discuss what may be putting you at risk when it comes to kidney stones, and help you create a plan to lower your risk in the future. Want to learn more ways to maintain a healthy lifestyle? Download our free Nutrition and Lifestyle Guide below! October 17th, 2017|Comments Off on Does Soda Cause Kidney Stones?